Occasions of Joy’s First Blogversary! I was one of the lucky mom bloggers who were invited to the first anniversary of Joy Mendiola’s blog Occasions of Joy last Sunday, February 20, at Baby Nathan’s Kitchen, One San Miguel Avenue, Pasig City. The invitation said we needed to be there by 8am because it was supposed to be a “Pandesal Party,” but I arrived a few minutes late because I still had to wait for my little boy to wake up and give mommy a good morning kiss. I know Mommy Joy could forgive me for that! True enough, there were lots of yummy pandesal for breakfast courtesy of Walter Bread, and those pandesal went well with tasty frozen foods (ham, sausage, chicken nuggets, etc.) from Mom’s Breaktime and freshly brewed coffee from Love Blends. To start the celebration, Jem Garcia gave a lovely violin rendition of “The Prayer.” Guest speakers, such as Pehpot Pineda and Jonel Uy, likewise graced the occasion. Pehpot talked about how she manages to blog (Note: She has more than 10 blogs!) and care for her 4 kids at the same time. Jonel, on the other hand, discussed the etiquettes for bloggers. Of course, an event is not complete without games. Two couples were called on stage to play the “Eat my “P” (Pandesal)” game, then the mommies participated in the “Pass the Pandesal” game. The following event sponsors were also acknowledged: Walter Bread, Svelte, ELRO Corporation, A-Z Direct Marketing, Clarity, Love Blends, MOD Magazine and Doña Maria Premium Quality Rice. Other sponsors include Funlipix for the photo booth, Enjoy, Me and U, Johnson & Johnson’s, Nesvita and Mr. Rafael Mendiola, Joy’s better half, who shouldered the expenses for the food and venue. Joy also gave a special gift to the first guest to arrive, Ms. Nora Aquino. Joy also gave away gift certificates to all moms present for one free session of Intense Diamond Peel at Clarity, which costs Php1,000.00 I like this very much, and can’t wait to have it done right away! Then it was chow time again! As much as I’d like to get a second serving of the sumptuous foods, I resisted the urge to do so because I didn’t want to be looking for the best diet pill afterwards. Moderation is key, right? Before going home, the guests were given loot bags, too! 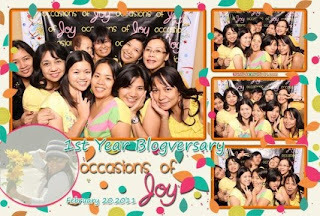 All in all, Occasions of Joy’s first blogversary was a success! Everyone had a great time, and I’m sure the guests present are already looking forward to the second year anniversary. What do you think, Joy? This entry was posted in Blogversary, Occasions of Joy. Bookmark the permalink. 7 Responses to Occasions of Joy’s First Blogversary! Hi Tetch! We'll see next yr…You're one of the firsts to receive an invite pag meron…Thanks! Saya saya naman! Long live, Mommy Bloggers! 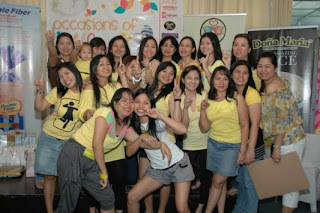 Mukhang enjoy na enjoy kayo , I wish I could join ….if malapit lang ang venue sa amin dito, I would go…hehehe! wow! this is fun! hope to meet all of you also in an event. wow! picture palang kita na everybody is happy..